Atopica is an FDA-approved, non-steroidal prescription soft capsule that is used to treat skin allergies in dogs. It is administered daily. Signs of skin allergies include scratching, licking, gnawing, chewing, skin infections, hair loss, terrible odor, and sleepless nights. Atopica (Cyclosporine) works by directly affecting the immune cells responsible for itchy allergic reactions to a variety of different substances. An effective and affordable generic of Atopica is Cyclosprine. As with all drugs, side effects may occur. In a field study, the most common side effects were gastrointestinal signs. Gingival hyperplasia and papillomas may also occur during the initial dosing phase. Atopica is a systemic immunosuppressant that may increase the susceptibility to infection. 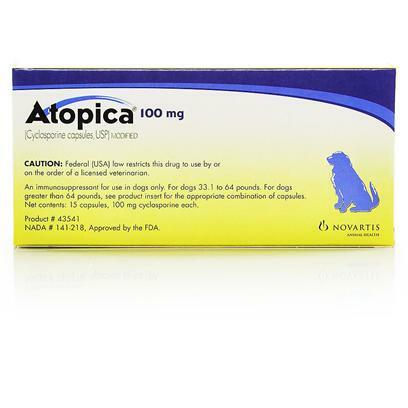 Atopica is not for use in reproducing dogs or dogs with a history of neoplasia. There are many possible drug interactions. Notify your veterinarian of additional medications, supplements, and vitamins, your pet is using. Atopica is for use on dogs of 4 lbs. and above. It is given in one daily oral dose for a month, and can be adjusted depending on the dog’s response until it often reaches a schedule of no more than every other day. The initial dose is based on the dog’s weight, according to the recommendation of a veterinarian.